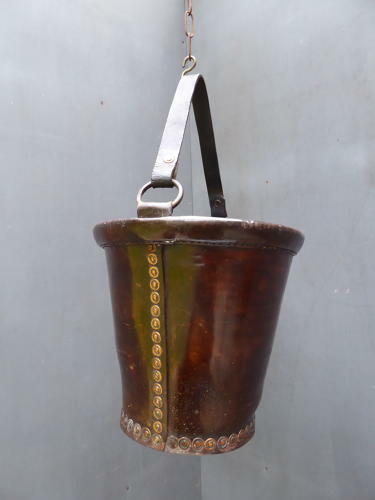 An exceptional example of an early antique leather fire bucket. In thick hide with a wonderful rich colour & sheen with beautiful copper rivets running down both sides & around the base. Two large cast iron rings support the original leather handle which is again studded with copper rivets. Not something which turns up very often, particularly in this condition & a great decorative piece! Minimal wear commensurate with age, amazing condition overall, the best one of these I've seen to date! Measurements do not include the handle.